Chocolate is the food of heaven and chocolate fondants have forever been one of the most coveted desserts around. I don’t know about you, but every time anyone in my family has ever eaten at a restaurant that serves chocolate fondants it gets ordered! The same is true for me, however for a long while now they haven’t exactly featured highly on my healthy eating routine…until today! I’ve put together this Low Carb Chocolate Fondant to answer all of my own, and your, chocolate prayers. The best part is that this gorgeous chocolate dessert is low carb and even Slimming World friendly! 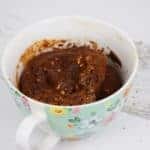 Six syns for an entire chocolate fondant, which might set you back 15 or 20 syns in a restaurant, is really pretty low making this perfect for special occasions when you still want to stay on plan! You can even enjoy it with lots of speed fruits to make it even more suitable! If you choose to eat your Low Carb Chocolate Fondant with ice cream or cream then, of course, you’d still need to syn that, but when the main event is only six syns then why wouldn’t you! 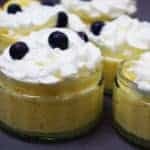 To keep the syns low in this recipe I used Elmlea Single instead of single cream, Elmlea is half a syn less, however, it does contain hydrogenated fats so you may prefer to count the extra syn for the recipe and stick to single cream instead. 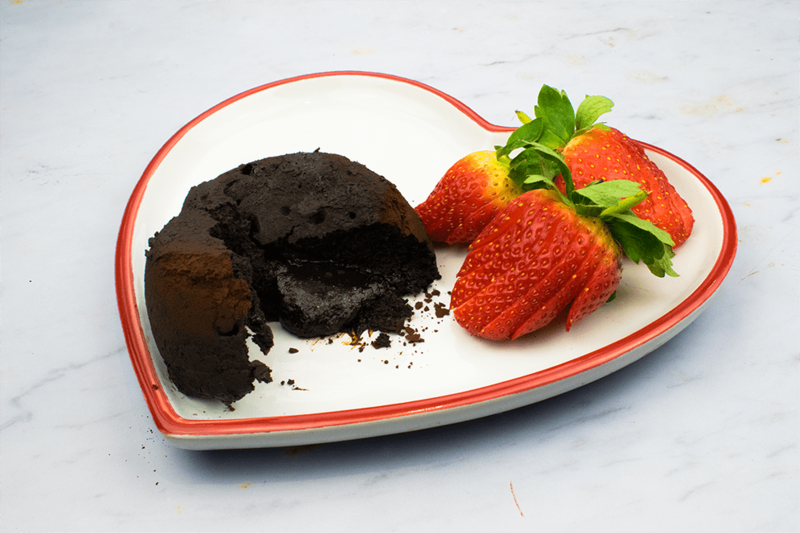 If you needed any other reasons to love this Low Carb Chocolate Fondant, you might want to know that it’s not only low syn, but it’s also gluten-free, free from refined sugars, suitable for low carb and low GI diets (like the Keto diet) and it is even a good source of anti-oxidants due to all of the cocoa powder! What more could you ask for from a dessert? 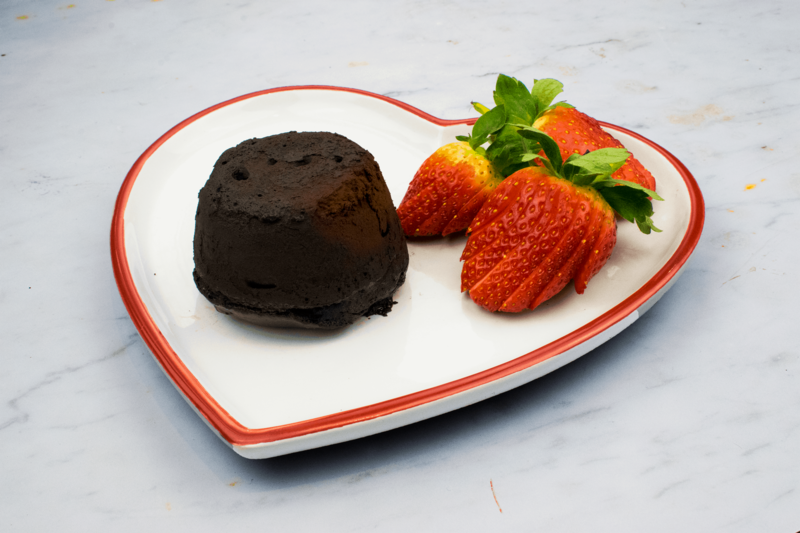 Of course, a Low Carb Chocolate Fondant is welcome any time of year, but it might be particularly suitable for any Valentine’s day celebrations you have coming up. Just because it’s a special occasion doesn’t mean that you should have to compromise your healthy eating plan so looking for new and delicious ways to introduce unhealthy looking desserts into that plan is the answer! You might remember my Healthy No Bake Chocolate Cheesecakes from last year, which were also ideal for your Valentine’s Day celebrations, but this year it’s all about the Low Carb Chocolate Fondant! This is a super rich, dark chocolate dessert. 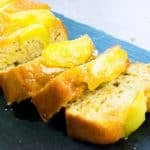 If you want to add a slightly sweeter edge to it then add a little extra Rice Malt Syrup or sweetener of your choice. However, personally when combined with some ice cream and fresh strawberries a bit of dark chocolate is just what you need for a romantic evening in! If you’re following this on Slimming World keep the recipe as it is below, however if you’re following the Keto diet or another low carb diet I would suggest swapping the Rice Malt Syrup for the equivalent amount of granulated sweetener (you could also do this on SW) as the syrup is relatively high in carbs. 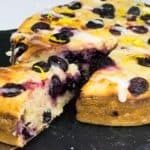 With the syrup this recipe has 12g of carbs (still well within your daily allowance) but if you swap to a sweetener like Sukrin for example it drops down to just 3.5g of carbohydrates! Proof that even if you're eating healthily, you can eat chocolate! Prheat your oven 180 degrees. Mix together the cocoa powder, baking powder and Rice Malt Syrup. In a separate bowl mix the eggs thoroughly and then add them to the cocoa powder. Mix until smooth. Add the cream and mix until you have a glossy chocolate batter. Coat the inside of two rounded pudding moulds or ramekins with some cooking spray and cocoa powder. Make sure to coat to the top. Divide your mixture between the two moulds and bake for 10-12 minutes. The tops should be cooked but still wobbly. 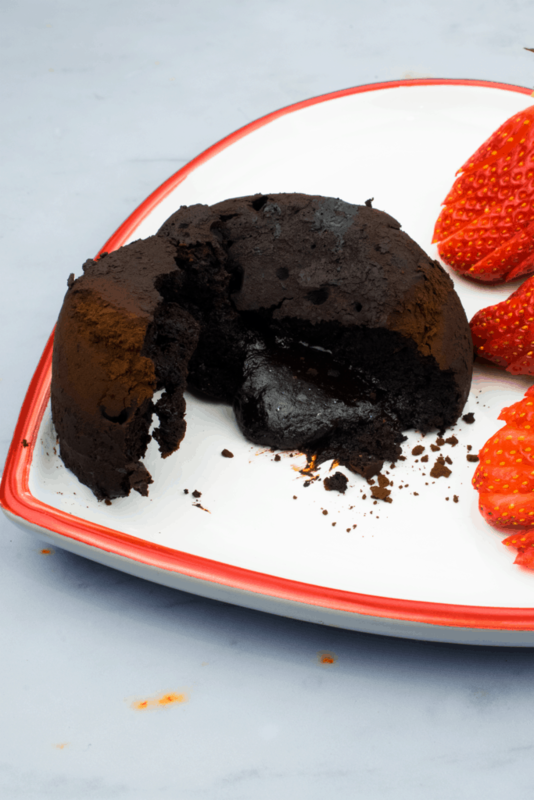 Remove from the oven and run a knife carefully around the inside edge of the moulds to loosen the chocolate fondant. To remove it from the mould, place your plate on the mould and turn the whole thing over. Carefully remove the mould from the fondant and enjoy! 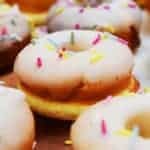 6 syns each on Slimming World. Syn values correct at time of writing. 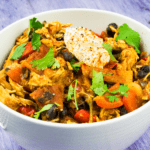 PLEASE DO NOT SHARE SCREENSHOTS OF THIS RECIPE - share links instead! Serves 2. 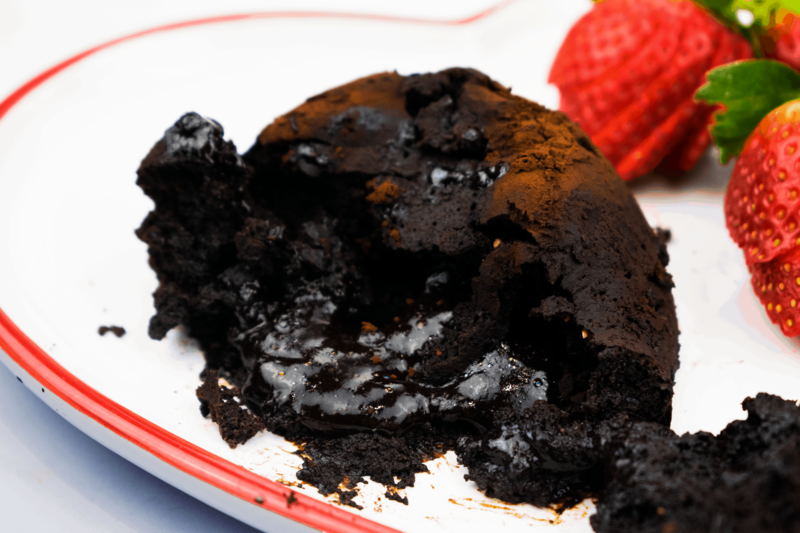 DON’T FORGET TO PIN THIS LOW CARB CHOCOLATE FONDANT RECIPE FOR LATER & FIND THE RECIPE VIDEO BELOW! Loved the recipe of chocolate fondant cake , it healthy and delicious! Omg, I can hear my waist is screaming for mercy. I want to have one bite !! Don't worry Calleigh! It's a healthy one, low carb, sugar free! Such a delicious looking cake! LOVE me a chocolate dessert :) And love that it's healthy, too. This looks so decadent. I love that it's low carb and healthy. 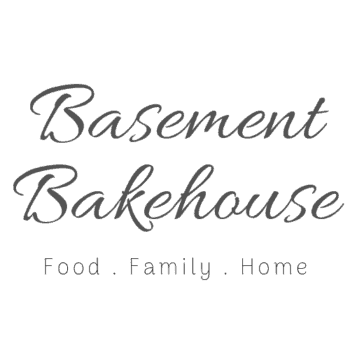 My sister is looking for low carb desserts. She's trying to get beach ready so I'm going to send her your recipe. Who doesn't love a good chocolate dessert? My boyfriend is a chocolate fanatic, so I'm sure he would love something like this. YUM! Your chocolate ooze is perfection. I'd add a big dollop of vanilla ice cream to the top. Delish, and perfect for an upcoming Valentine's Day dinner. Oh I’ve hit a serious chocolate craving now. This would be perfect for valentine’s day. I understand the need to enjoy chocolate without ruining your diet! It looks like you've come up with a great, guilt-free dessert. Yum! Looks like the perfect dessert for Valentine's day, especially for me - who tries to maintain a low-carb diet. Looks delicious! This looks so delicious! Such a perfect, special dessert for Valentine's day. It looks so rich and yummy! I want to do this for a dinner party but don't want to be whisking eggs in my kitchen diner with the guests at the table, can these be re-heated? or can I make up the batter ahead of time? Need an answer before next Saturday 3rd Feb please. Hi Nicola, they can't be reheated I'm afraid but you could definitely make the mixture beforehand and just pour and cook before your guests eat. Please remember to dust the inside of the mould with cocoa powder or drinking chocolate (which will make it a bit sweeter!) as otherwise you'll really struggle to get it out of the mould and that would be a disaster when you have guests there. Also, they're pretty rich so double check with your guests if they prefer something a bit sweeter, at which point you could add more sweetner or swap one tablespoon of cocoa to drinking chocolate. This would impact the syns but it's always worth checking with your guests! Enoy! Thank you Cliona, I shall do a dummy run later today, we need to be sure it will work....he he he...who am I kidding, I just need to get them tasted they look SOOO scrummy. Sorry if I appear to be taking over this thread, and correct me if I am wrong, but either it should read 6 teaspoons of cocoa for 6 syns or if the 6 tablespoons is correct then we are looking at 15 Syns for the cocoa.